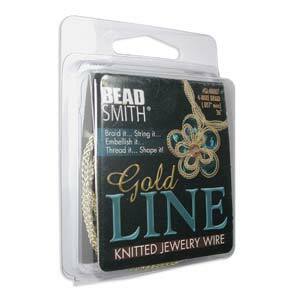 Gold Line & Silver Line Knitted Jewelry Wire use the strength & elasticity of fine (.007") plated wire to create a knit for artist to make jewelry never before possible. The surface of the wire is covered with poly-nylon which prevents tarnishing. You'll find it suitable for designs which are delicate, supple, light and bright. 3-needle is 1.4mm in diameter and 4-needle is 2.3mm in diameter. Available in 3 ft/box. Braid it......create a two-tone look by mixing goldline & silverline together! 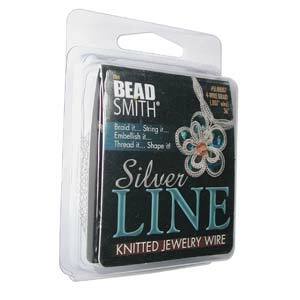 String it........put it directly through large hole beads! Embellish it........attach assorted seed beads or dangles! Thread it........add a touch of color by inserting color thread through the centre!